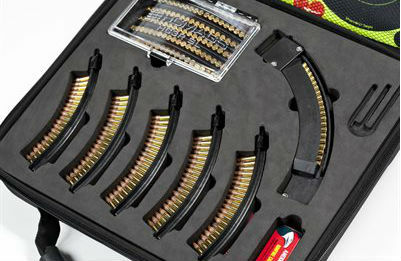 I don’t care for the idea of having to carry around the magazine PLUS the clips and the caps and even that speed loader tray (video on the speed loader tray here) to make things quicker. Having to load 2 clips in each magazine + 5 rounds manually to get the full 45 round capacity isn’t ideal. Even looks less like a good idea when you realize that the loading process is prone to error as shown in the company’s own promotional video I posted above. There are so many inexpensive 10/22 speed loaders on the market right now for regular 10/22 mags; you could save your thumb, save money, save transporting extra items, and probably not waste that much extra time (if any at all) loading the rounds the old fashioned way, one-by-one. If these mags look like a good idea to you, they are available for purchase or you can get more information over at the company’s website HC Mags. Keep in mine the cost of one 45 round magazine with one 20 round clip from HC Mags is $43. Compare that with the reliable highly praised Ruger BX-25 magazines which go for around $25. The idea seems like a decidedly more complicated version of the Cammenga AR-15 magazines, where you can just slide the spine down and drop the rounds in. Now when people talk about their “.22 clips” I’ll be like “Oh you use those HC MAGS? They are the only ones I know which take clips”. I’m going to go ahead and say no. Will these work in my rjf 1022 bandioler? Seen it at a gun show before. Interesting idea, but we decided to pass on it. My dad and I already have 2 BX-25s each, plus 3 BX-10s each. Plus, we haven’t been shooting the 10/22s as much, since he bought an M&P 15-22. I like loading rounds one at a time, it shows I mean business. This thing VIOLATEs, nay outright RAPEs the KISS principle. Not to mention the time he took to load the clips. And you’ve got 15 mechanisms working there. And the 20 rounds on the side do… what? Oh, and you need to top it off with 5 rounds if you want to shoot 25 times. And he called them both “stripper clips” (nope, not stripping the rounds off) and “speed strips” (again, no, those are rubber carriers for revolvers). The only strippers I’m interested in come from Russia and are purchased with one dollar bills. Does this mean someone just made “magazine clip” a legitimate thing you can ask for in gun stores? Good thing Barry isn’t around to see this. At which point? I’m soooo confused as to which hand. Sooooo… He loaded the clip to load the magazine to load the rifle?